Cooler Oil Means A Better Protected Engine. The higher your power, the harder you drive, the more important it is to protect your oil. 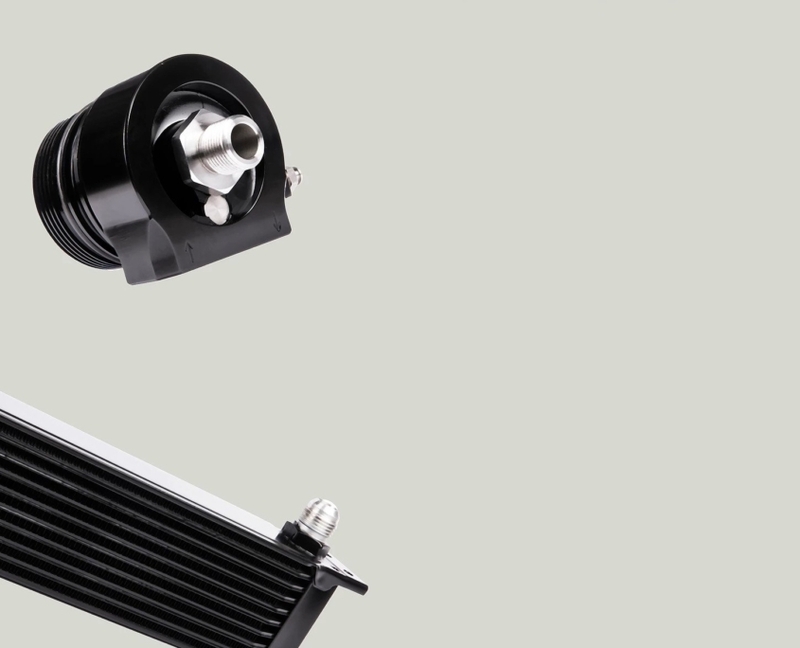 Why Fit An Oil Cooler Kit? Our much-anticipated Oil Cooler Kit is an essential fit for any hard-driven MQB 2.0 TSI car running high power levels or in hot climates. It’s a complete ready to install package, using a clever sandwich plate design for straightforward and reliable installation. 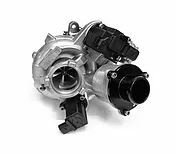 Adding power to these TSI engines generates more heat to disperse. 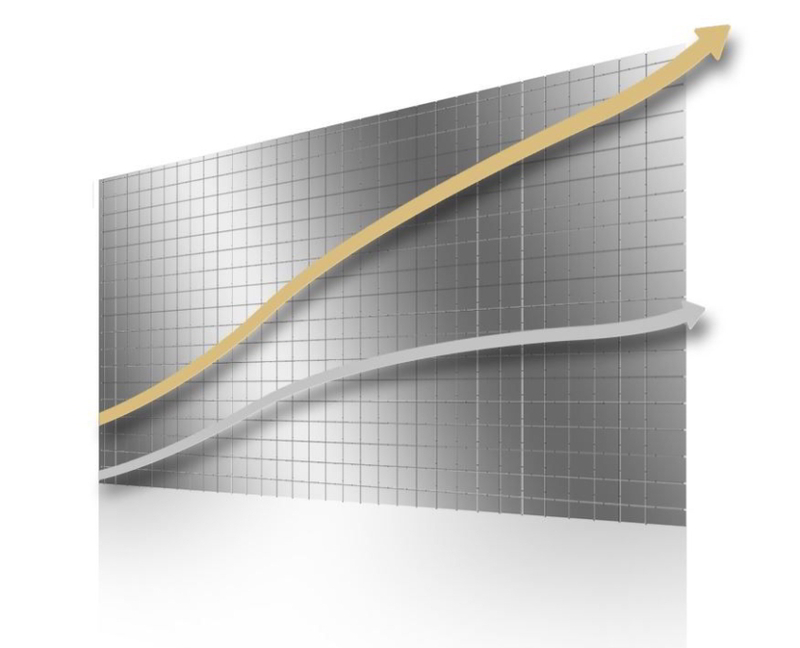 Significantly increased oil temperatures means only one thing: a decrease in the ability for your engine to stay properly lubricated. At the same time, it’s really important not to over-cool the oil; our 10-row kit is perfect. 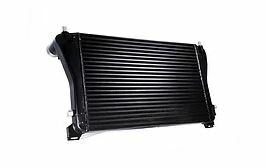 Under hard driving, the stock oil cooler is easily overwhelmed. Failures start to occur when oil cannot dissipate its collected heat fast enough and the oil begins to thin and degrade – losing its lubrication properties. The RacingLine kit solves this problem: by adding in an additional air to oil cooler positioned right in the airflow in the front of the car, oil temperatures are reduced by around 15 – 20 degrees centigrade (of course dependant on how the car is being used, ambient temps and state of tune). Our kit retains the factory oil to water cooler and adds to it with the front-mounted cooler – doubling up your cooling capability with less heat transfer into the water system. As the oil moves away from the heat inside the engine, its temperature drops significantly as it is pumped through the densely packed fins of the 10-row cooler’s large surface area mounted right in the cool airflow. Supplied as a complete kit with every part ready for straightforward install. Our 10-row stacked plate design efficiently forces the hot oil through a series of aluminium pressed plates. Heat dissipates as cold air moves across the plates. Our unique sandwich plate oil take-off includes a clever internal pressure-control valve control to direct oil flow through the cooler at correct flow/volume. Precision machined billet components utilising the latest 5 Axis CNC machines for perfect accuracy, first time, every time. 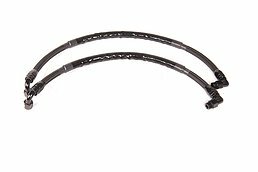 Our oil lines feature an attractive outer nylon braid strengthened by a stainless steel inner weave for maximum resilience. Protective external sheath avoids any rubbing damage in use. 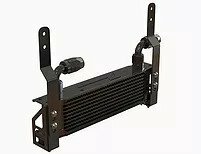 The front-mount location brackets of the RacingLine cooler kit places it in the optimum airflow and ensures that oil temperature drops and excess heat is funnelled out efficiently. The kit includes a pretty special high-flowing oil filter. Made from stainless steel micronic filter cloth with magnetic pre-filtering, capable of flowing 5x more oil than the factory paper filter. As you’d expect, the RacingLine Oil Cooler is a beautifully detailed complete kit, developed exclusively for the EA888.3 engine. 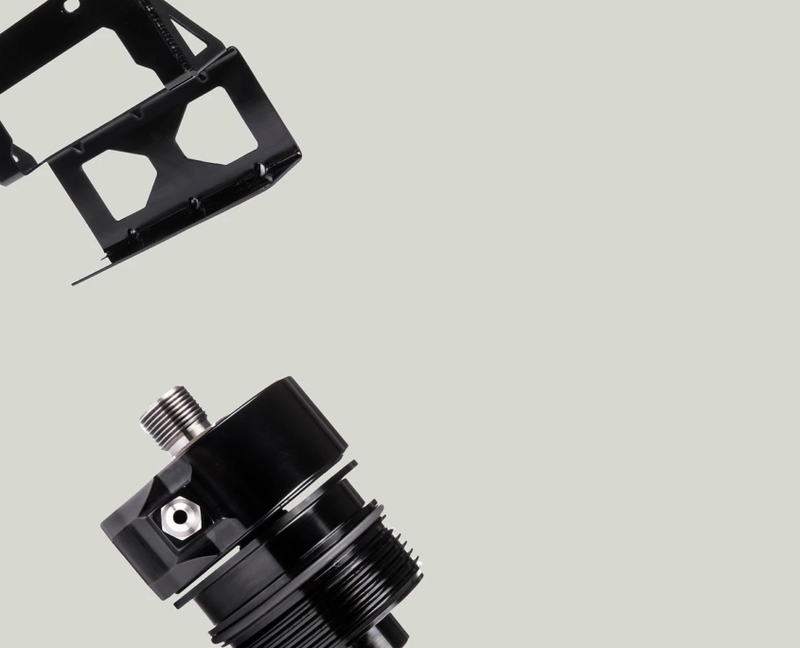 The system is designed for straightforward fitting and ultimate reliability. Everything needed for perfect fitment is included. Unlike some oil cooler kits, with the RacingLine Performance kit there is no need to remove the intake manifold to access oil galleries for a feed in and out of the engine. Our clever oil filter adapter enables the oil cooler sandwich plate to be installed underneath the current oil filter housing on all EA888.3 engines – just screw off and replace. This sandwich plate includes an integral pressure relief valving system to protect the system from pressure spikes. 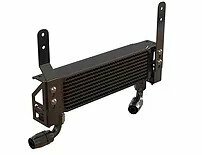 10 row stacked-plate oil cooler radiator, flowed to obtain maximum heat dissipation without undue pressure drop. Optimum front mounted location behind front lower grill aperture with all necessary brackets and fixing kit supplied. 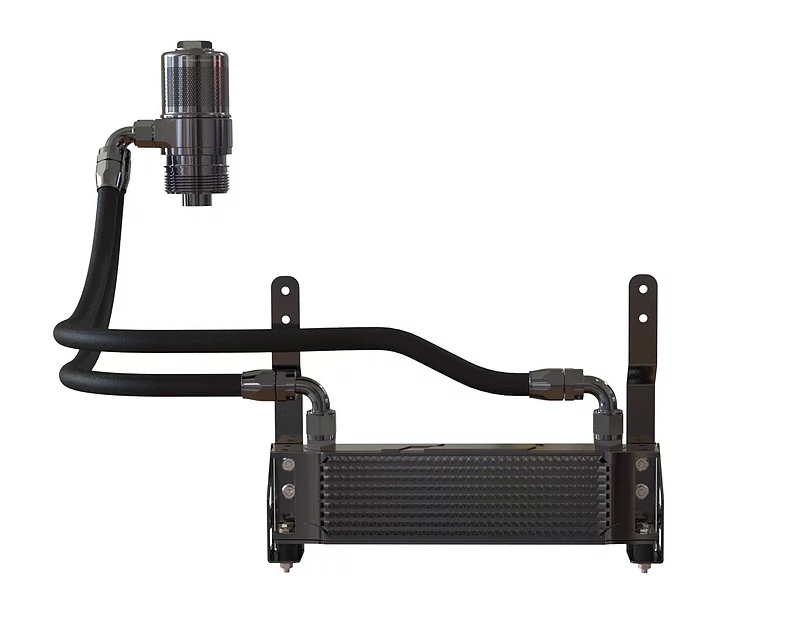 210 Series stainless steel, nylon braided feed and return lines run past the chassis leg into the bumper cavity, then connecting to the oil cooler core. AN10 210 series Nylon braided feed and return line. Billet CNC non-return sandwich plate. Fitting kit containing all necessary nuts, bolts, washers and rubber mounting bobbins. AN10 10-row oil cooler core. Billet oil filter housing with removable drop in filter. NOTE: 2015 AND OLDER CARS MAY ALSO REQUIRE FITMENT OF VWG PART 06L115678Q (A PLASTIC OIL STEM INSERT). THIS IS A RUNNING UPGRADE FROM VWG DEALERS SO MOST CARS WILL HAVE HAD THIS PART UPDATED DURING EARLIER OIL CHANGES. The Oil Cooler Kit includes a pretty special oil filter. 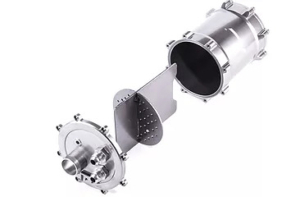 The filter element is made from high-flow stainless steel micronic filter cloth – a medical grade material guaranteed to filter out oil contamination better than paper-based filters, all helping to avoid the risk of resultant engine damage. 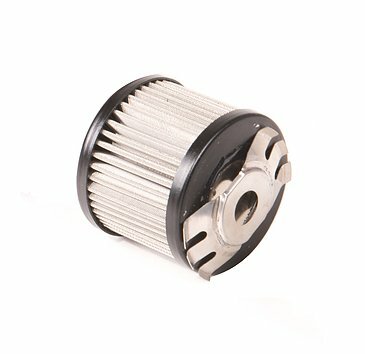 The filter itself is available separately from all RacingLine dealers for servicing. Whilst this filter has a much longer service life than the factory paper elements do, we recommend as best-practice to change filter with every oil-change. 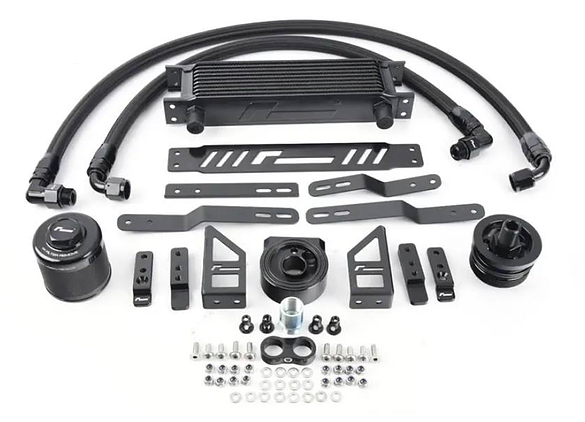 The Oil Cooler Kit comes supplied with two bracket kits. One kit is for Audi S3 models, the other is for all Golf 7 models – which will also serve as a universal mounting kit for other MQB models. Our OEM Performance Software is simply the most effective modification you can make to the 2.0 TSI engine, especially when used alongside our performance hardware. That’s what makes the OEM difference. The most sophisticated oil management system to separate oil and moisture vapours out of your intercooler and intake charge, and protect againist oil-surge. Our OEM+ Stage 3 upgrade offers a complete, turn-key package that is entirely usable on a daily-driven car yet offers devastating performance just one squeeze of the throttle away. 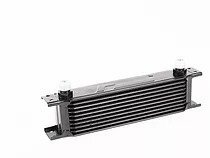 Our giant sized, high efficiency front mounted intercooler is an essential upgrade to keep intake temperatures low – and keep power levels high.